University Affairs magazine has released a compilation of top campus traditions across Canada. Shinerama, a nationwide fundraiser that started at Laurier, has made the list. Shinerama began in 1961 at Laurier’s Waterloo campus as an alternative to traditional first-year initiation antics. Paul Enns, president of Laurier’s sophomore class (then known as Waterloo University College) and chair of the initiation committee at the time, had an idea to improve how incoming students experienced the traditional welcome to campus life. Enns thought a fundraiser could bring first-year students together while giving back to the local community. 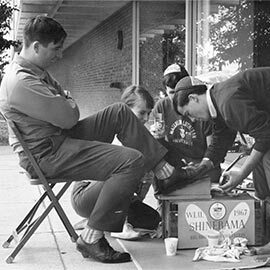 After a brainstorming session with the director of information and alumni relations, the idea of a shoe-shining campaign was put in motion. A remarkable $1,358 was raised that year for Sunbeam Home, an agency that supports individuals living with developmental challenges. By 1963, Laurier students had raised almost $10,000 for the local non-profit. The Canadian Cystic Fibrosis Foundation (CCFF) learned of Shinerama’s success through the family of a child living with the disease. The foundation was challenged to make Shinerama work as a CCFF fundraiser at other schools. And it did. While the idea was taking off at other schools across the country, Shinerama experienced a decline at Laurier until the university partnered with CCFF in the late 1970s, giving new energy to Enns’ original idea of team building and good will. Shinerama at Laurier is coordinated by the Students’ Union. DiCiantis expects approximately 2,400 students to participate in Shine Day this September. He hopes Laurier students can raise another $100,000 – a goal they have achieved several times before. Shinerama has raised more than $25 million for cystic fibrosis research since its inception. Shine Day is scheduled for Sept. 12 at Laurier’s Waterloo and Brantford campuses. To register a student team, volunteer or make a donation, please contact shinerama@wlu.ca. Read about Shinerama in University Affairs’ top campus traditions.